Käyttäjänimi tai salasana on väärin. Ole hyvä ja tarkista, että olet kirjoittanut oikein. Tämä käyttäjätili on deaktivoitu, eikä sitä voi enää käyttää. Hyvä Panda! Sinulla on enää kaksi yritystä muistaa salasanasi (turvallisuustoimenpide), joten ole huolellinen. Jos et muista salasanaasi, klikkaa "Unohditko salasanasi"-linkkiä. Hyvä Panda. Olet ylittanyt sallitun määrän yrittää kirjautua sisään. Turvalllisuussyistä sinun täytyy nyt odottaa 3 muutama minuutti ennen kuin voit yrittää uudelleen. Saat uuden salasanan myös klikkaamalla "Unohditko salasanasi"-linkkiä. Keitä ovat Max ja Ella? 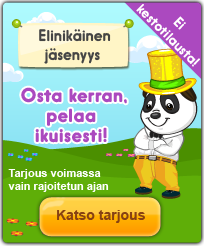 Puuhaa Ohje: Ruutukaappauksen, eli kuvan ottaminen Ohje: Sarjakuvan tekeminen Tee itse: Piirrä oma Panda Tee itse: Reseptejä Testaa tietosi: Panfussa opittua Testaa tietosi: Panfuvisa Testaa: Mikä Bolly olet? Testaa: Mikä Pokopet olet? Testaa: Millainen Panda olet? Viime yönä tapasin hirviön… mutta älä pelkää! Tämä on erittäin mukava hirviö – ihan tarkkaan ottaen, halaushirviö. Hänen nimensä on Krunchi! Mutta tarvitseeko minun kertoa lisää? Yksinkertaisesti kirjaudu Panfuun, käy rannallanne ja sitten voit henkilökohtaisesti tutustua Krunchiin. How’s it going? Summer seems to be creeping closer only slowly this year. I couldn’t even sunbathe last week. Max, we’re talking about ice cream here! Yup, I know – chocolate and strawberry. But you can’t just lie in a tub full of ice cream?! Pandas, Max and I wanted to tell you that we’re set to go travelling. We’re going to Brazil and we’ll stay there for a while. Don’t worry if you don’t hear from us – Brazil and its rain forests are gigantic, so we’ll probably be cut off from the outside world for days or even weeks on end. Max, what’s that gloopy stuff dripping from your suitcase? Did you put all your ice cream in there? Really?? 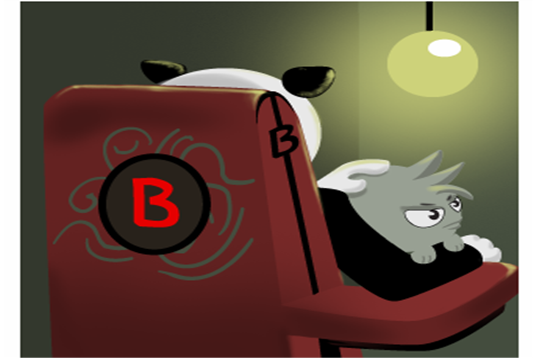 Have you figured out what’s up with the mysterious call at the Beauty Salon yet? Ella and I were so close, but then we totally messed up. …and a third. Before we knew it, all the cookies were gone. We really feel bad about it and our tummies hurt, too. Kamaria was really mad when she found out. She will have to get together all ingredients again before she can make more cookies. I hope it won’t be too late by then! Is there something you can’t get enough of? Chocolate chip cookies or pancakes maybe? Yes!! No! Not really …I was at the Beauty Salon, relaxing a bit today, when I overheard a very mysterious conversation. I was minding my own business, slices of cucumbers on my eyes, when I suddenly heard a shrill noise. Rrrrrrrring Rrrring. The phone! It wouldn’t stop ringing!! Nobody seemed to want to answer the phone at first, but when I was just about to pick the cucumber off my face, someone finally picked up. I also thought it rang a bell. I kept racking my brain…but then it came to me: It’s the beginning of the quest “A mysterious call”. Yaaay, we can play the quest again soon! Judging by the phone call, probably from tomorrow Make sure you check your Quest Book if you want to do something cool tomorrow. P.S. If you’re on the lookout for some spring decoration, keep checking the Surprise Machine this week! There’s a floor pillow in the shape of a water lily to be had. Lovely! How are you? Are you enjoying the spring-like weather? Luckily we haven’t really had a long winter this year. The snow on Panfu has melted already, too. Yay, spring is around the corner! In some places, spring has already sprung. I keep seeing the first few spring flowers in some gardens. Have you noticed them? My Pokopets are also feeling happier and want to go out for walks a lot more. You should still be careful not to underestimate the current temperatures – you can get sick quite easily in these fresh temperatures. Don’t forget your hats! Just make sure your ears are warm. Lili has knit super cool hats that I can present you very exclusively today. Nightcaps – not only for sleepy heads! Classics – they go with just about anything! 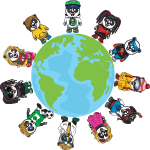 The cool ones – with a message! Do you know what YOLO and SWAG mean? That’s what it says on the two hats I like most. But before I put them on, I want to make sure I won’t embarrass myself. Well, I feel like drumming today. BOOOM!! P.S. 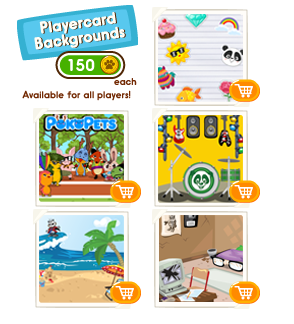 You can get the Player Card backgrounds from the Clothes Catalogue. That took ages…and then the door! I had totally forgotten how much it takes to open that thing. Fiiiine. But I’m only doing it so I can protect you during the quest Have you guys solved the puzzle yet? 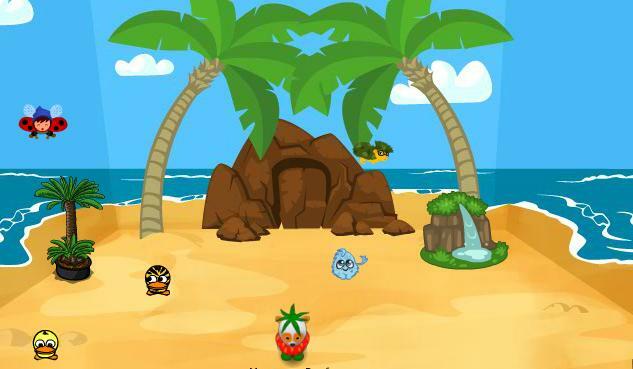 Greetings from my dream island “Maxland”! I don’t think so. I just got news from the Panfu headquarters that will put a spring in your step: The Bigfoot quest is back in the Quest Book!! All loyal Pandas know the story surrounding the poor castaway Yeti, I’m sure. For those of you who don’t, I’ll just tell you to brace yourselves and be prepared for lots of excitement and adventure. The poor fella is at the Beach, totally exhausted and starving. He needs our help! If your heart’s in the right spot, go and see him! Important tip for you: You have to start the quest from the Quest Book. It’s called ‘Bigfoot’. Quickly now, we don’t want Bigfoot to actually starve, do we? 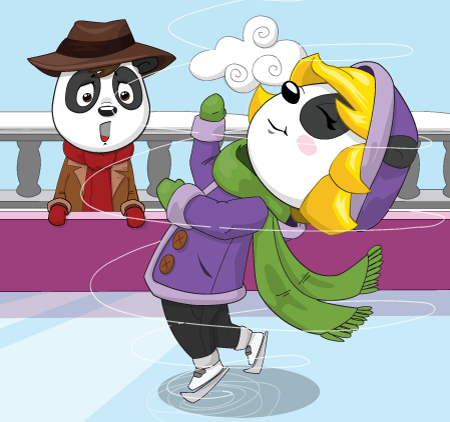 Have you put on your ice skates and practiced your twirls on the ice yet? It’s just so much fun! Say Max, why is your mouth hanging open like that in the pic? You look as though you’ve seen a ghost! Pfft, I’m not afraid of ghosts. After we’ve defeated quite a few creepy creatures here on Panfu, ghosts are more like pet dogs to me. So why the weird face? But then I stepped onto the ice! Of course! How about you? Are you stable on your skates or maybe even have a few tips for me? Yaay, the Castle is free of ice!! We went to the Castle again last night and gave Kamaria a thermos full of warm tea. The poor thing was freezing! Imagine you didn’t have any heating! I would just cuddle up with a blanket all day…brrr…I get goosebumps even thinking about it. Kamaria was surprisingly cool with the tiny ice age and everything. I bet you’ll think the same when I tell you about the suggestion Kamaria came up with: Because she kept slipping on the icy ground, she put on ice skates and moved across the Castle like that. She liked it so much that she had the idea to set up an ice rink on the Castle Terrace. See, what did I tell you? Go to the Castle today and have fun!